The #1 striking weapon for police and security worldwide! Our solid steel Expanding Baton is one of our most powerful and popular items. It extends with a flick of the wrist and features a comfortable molded rubber handle for a secure grip. This baton will actually expand as you swing it for a strike. This gives you the element of surprise as your opponent will not know you are holding a baton until it is too late to react. A heavy duty nylon belt holster is included. Available in 16 inch, 21 inch and 26 inch models. *Please Note: Before using your baton for the first time it is recommended that you lubricate the inside of the expanding baton with a spray lubricant such as WD-40. Unscrew the base of the baton handle and spray the locking telescopic segments as well as the spring steel lock. 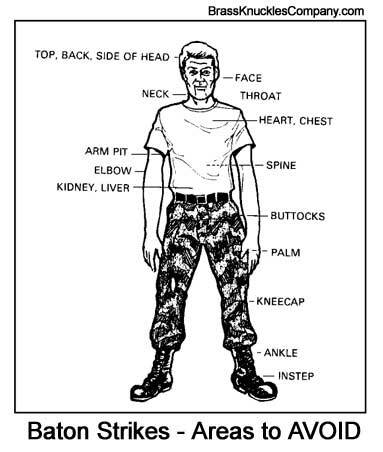 The drawings below are from a training manual for an international law enforcement organization. 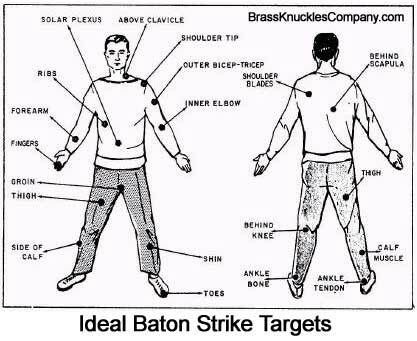 The first diagram shows acceptable areas for police to strike subjects that will not cause long term injury and the second diagram shows areas to avoid where strikes may cause long term injury.